Sunsets are simply stunning from this lovely apartment! 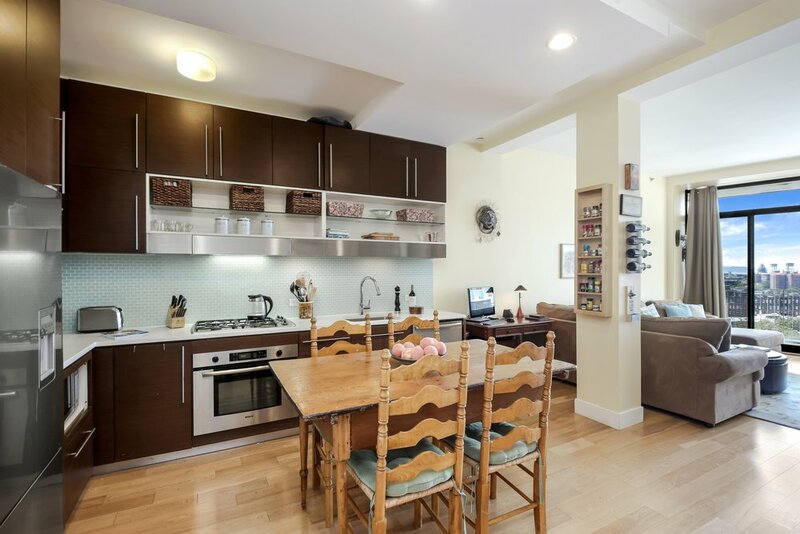 At the crossroads of Downtown Brooklyn, Fort Greene and Boerum Hill, this expansive one-bedroom condo offers fantastic space, and modern design. The modern kitchen features custom Wenge cabinetry, Caesarstone countertops, Bosch and Fisher & Paykel stainless steel appliances, glass tile backsplash, and ample storage and work space. There is more than enough room to carve out a dining area adjacent to the kitchen, while the living area offers plenty of space to spread out and relax. The bedroom has a large closet custom fitted with California Closets and the same amazing windows and view as the living room. The four-piece bath has an oversized soaking tub, a walk-in shower, and modern fixtures and finishes, including mosaic and marble tile. The apartment offers an in-unit washer/dryer, a large entry closet, also customized with California Closets, wide plank oak flooring and high ceilings throughout.